If your Royal Oak MI business or home has water damage from a storm, flood, broken pipe or other catastrophe, Emergency Restoration has the equipment and knowledge to quickly remove the water and dry your structure and contents to prevent further loss. Our water damage restoration team in Royal Oak MI has the high tech equipment and expertise to minimize the water damage and begin the water restoration process. 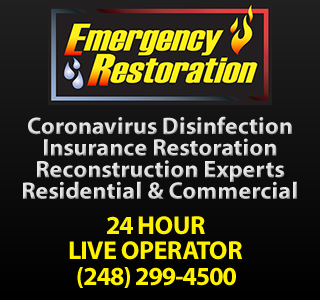 Our 24/7 water damage restoration service in Royal Oak MI puts you in contact with a trained IICRC-certified technicians. Our technicians can answer the many questions you may have on what to do first to limit the water damage before we get to your home or business. If not handled quickly and properly, water damage to you home or business can begin to cause severe damage. Our Royal Oak water damage restoration team is skilled in the many aspects of water removal and emergency water restoration. Our Royal Oak MI certified technicians will remove all the excess water from your hard floor surfaces, carpet and padding with our truck mounted water extraction equipment. We can begin the water damage restoration when all the excess water has been extracted by our water damage restoration team in Royal Oak MI. Emergency Restoration's managers and employees are certified and have attended the most recent water mitigation classes. The Vortex Drying System is one of the many water restoration systems we regularly use. This system is highly effective and one of the least intrusive methods used. We monitor the moisture levels in the air to ensure we have placed the dehumidifiers and air movers in the most effective locations. Our Royal Oak MI technicians will monitor moisture levels in all porous surfaces. Only after the correct moisture levels have been reached, the water damage restoration process can safely begin. Our water damage restoration team in Royal Oak MI specializes in water damage restoration and water removal due to many types of disasters including flood, storm damage, broken pipes, and other emergencies.